Now that PDC has finished, I decided to collect all of the Azure sessions up so that I could tick off which ones I have viewed, and which ones I have yet to watch. Most them them don’t have the session available as a download, but they are all available as a live stream immediately! There is a new profiling tool for Windows Phone 7! Enhancements to Azure Access Control Service. Can federate authentication to Facebook, Google, Yahoo, etc. I’ve done a few presentations on Windows Phone 7 now. I still haven’t processed and uploaded my talk on Metro UI concepts, but I’ll get it up next month. I am doing another presentation next week in Melbourne, this time I convinced Jarred Sargent to join me as a co-presenter. Windows Phone 7 is Microsoft’s latest approach at the mobile phone market. It is a drastic shift away from their previous attempts at trying to bring Windows XP feel into the palm of your hand. The entire WP7 experience has been standardised to follow the “Metro” theme which embraces concepts such as discoverability, content over chrome, and touch as the primary input (without the fiddly stylus). Microsoft do not actually create these phones themselves, they create the software and hardware manufacturers produce the phones. Similar to how Google does it with Android. Join David Burela & Jarred Sargent as they give an overview of what the Windows Phone 7 platform is and how to get started with it. It was my first time attending MXUG, the group was mostly attended by Ruby on Rails and Java developers. There were over 40 people there but only myself and 2 other .net developers, it was a very different experience from my usual user groups. I thought that others might be interested in what goes in at a non-.net usergroup. The evening was divided into 2 full talks, Pizza & beer break, and then lightning talks for anyone that wanted to stand up and talk. I’ve tried to give a summary of what topics were talked about. Chef is a server configuration tool for *nix / BSD machines. You have a series of “cook books” which define server configurations, such as “have folders configured this way”, “must have apache installed”, “install php”, “xcopy from the drop folder”, anything you might do to usually configure a server. 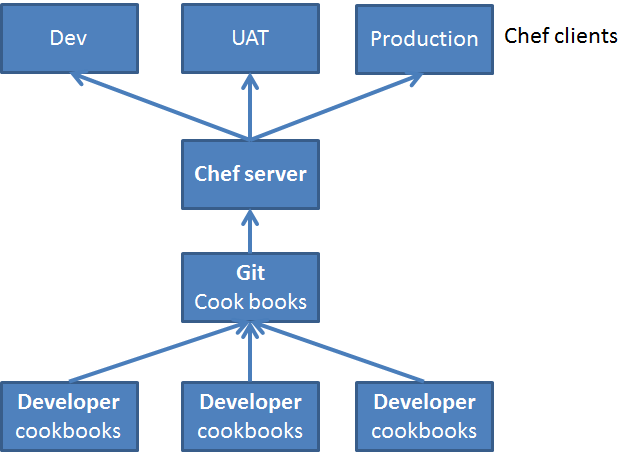 All of the cookbooks sit in your GIT server, you then push the cookbooks to the chef server. The chef clients (the computers / servers installed with the chef client) then use the cookbooks to make recipes. In a way you can think of it as being like TFS deployer for the *nix world. The chef recipes are Ruby DSL. The chef system is smart enough to know the difference between Apt-get and Yum. You just say “get the apache package” and it will sort out how to get it. Chef uses CouchDB under the covers. @BrentSnook did a quick 5 min talk on cool things they have been doing with text to speech commands. On macs it is “say”, on linux it is “festival”. e.g. say “hello” will make the computer read out ‘hello’ in the default voice. You can still use it with JQuery (that is about all he had time to mention). Getting BA/testers to write tests is more useful, tools like cucumber help. The problem is trying to get a BA’s computer set up to run cucumber tests can be quite an ordeal. he uses a .bat script to install prereqs onto a machine (tomcat, java, etc). then uses gems to install the rest. Then he runs a command script to automate the browser. That way the BAs can see if the tests are working, and see that the system does work. It lists all of the Microsoft Australia staff that are working with Windows Azure platform. If you looking for a Microsoft contact to ask questions of, they would be a great place to start. He talked about how they are changing their SQL tool ‘Toad’ to work well with the new cloud databases and even how they are doing cross database queries and migrations. Microsoft has 2 new certification exams coming Feburary 2011: Silverlight 4 and Windows Azure. They are a great way to see what type of content will be on the exams. If you have never taken a certification exam before then this is also a good inexpensive way to experience the exam process.